The topic of an additional stop for Amtrak trains between Vancouver and Bellingham, WA has finally caught the attention of local media. The need has existed for a long time. People who live in New Westminster, Surrey, and Delta who want to take a train to Seattle or Portland have to either travel to downtown Vancouver in order to catch a train that takes them right back out to New Westminster, Surrey, or Delta, or get a ride to Bellingham and catch the train there. A possible solution has come for for this because of a seemingly unrelated event. Burlington Northern Santa Fe owns the train station building in Blaine, WA. It's 100 years old, in a state of disrepair, and hasn't been used as a passenger stop since 1980. BNSF announced a plan to demolish it, and people in Blaine decided that this was a bad idea. 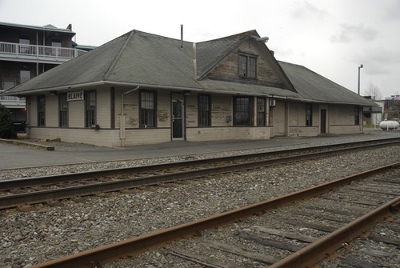 Not so much because of heritage value of the building, but because they recognize that access to passenger rail service would be beneficial to the community. The station is within walking distance of the Peace Arch border crossing, although it would seem to be further if you're carrying heavy luggage. It should be possible to arrange secure parking for those people in Surrey, Delta, etc. would would like to catch a train in Blaine, and leave their car there for a few days. I'm going to be at the Vancouver Law Courts (specifically, at the corner of Nelson and Hornby) at 9:30 AM on Monday, November 28. The occasion is a court hearing on the Prosperity Mine proposal by Taseko Mines Ltd., based in Vancouver. This proposal is for a gold and copper mine in the Nemiah Valley, southwest of Hanceville, BC. It calls for dumping mine tailings in Fish Lake, known to the Nemiah Band (Xeni Gwet'in) as Teztan Biny. I've been to every part of British Columbia sometime during my life, and the Chilcotin, along and south of route 20 between Williams Lake and Bella Coola, is my favourite. The last time I was there was about 14 years ago. I saw the herd of wild horses in the Brittany Triangle. Several people told me I should go to Fish Lake. I was within 5 km. of it, but didn't go there because the road was too rough for the car I was driving. Blue Gold: The Tsilhqot'in Fight for Teztan Biny (Fish Lake) from Susan Smitten on Vimeo. This project has already been turned down by the Federal Ministry of Environment. Taseko Mines responded by renaming the proposal the New Prosperity Mine, and trotted out the bogus claim that the project would create 71,000 jobs. (Taseko had only 414 employees in 2007.) They're insulting our intelligence, and they're certainly not fooling the Nemiah Band. An article in the August 30 Vancouver Sun, Cities push province for electronic voting, says that three BC municipalities are trying to get the influential Union of BC Municipalities to endorse the idea of internet voting. The UBCM should say "no" to this idea. So should Elections BC, the Federal government, and all provincial governments. We shouldn't accept any voting arrangement that doesn't provide paper ballots that can be counted in the presence of multiple election officials and scrutineers, and can, if necessary, be recounted. Here's a better idea. We got an excellent turnout with the mail-in ballots used in the recent HST referendum. Oregon has been using mail-in ballots since 1998, and Washington State started using mail-in ballots last year. It has worked well for them; voter turnout has gone up, and the cost of conducting elections has gone down. Let's go with something that works, and can be trusted. I've pointed out before on this blog that the Conservative Party of Canada has a history of running campaign advertising that insults the intelligence of Canadians: see The Conservative "Tax Trick", published in July, 2008. I heard another one of these insults on the radio yesterday. The ad claims that the New Democratic Party's "cap and trade" proposal would add ten cents to the price of a litre of gasoline. Really? I can't give you an informed answer on this, because I haven't studied exactly what it is that the NDP is proposing. However, any Canadian who drives a car knows that the cost of gasoline has risen 20% over the past six months (much more than ten cents a litre), and 48% since the Conservatives became the government of Canada in February, 2006. So, when the Conservatives accuse anyone other than themselves of increasing the price of gasoline, it's an obvious case of the pot calling the kettle black. Here's my constructive suggestion for the Conservatives. Regardless of how the election turns out on Monday, the Conservatives will still have seats in the House of Commons. Prime Minister Harper will probably retain his seat, even if he is no longer the Prime Minister. So, how about this? The Conservatives could phone or send emails to the petrochemical interests that fund the Conservative Party of Canada, and say, "Could you please drop the price of gasoline back to what is was in October, 2010?" If the Conservatives could accomplish this feat, I'm sure that a lot of Canadians would be grateful enough to vote Conservative next time around. It has now been four years since 32 students and faculty members were killed on the Virginia Tech campus. I earned a B.A. Degree from Virginia Tech in 1972. I have lived 2,500 miles from Blacksburg for the past 30 years. This doesn't matter. I attended many classes and labs in Norris Hall. Ambler Johnston Hall was completed during my sophomore year; I never lived there, but I visited many friends and acquaintances who did. Whenever I'm in touch with my fellow alumni, the topic of the massacre comes up. Some of them have children who were students at Virginia Tech when the massacre took place. What has changed since April 16, 2007? Unfortunately, things have gotten worse. The killing of a federal judge, a nine-year-old girl, and four other people in Tucson, AZ in January caused the subject of gun violence to resurface briefly. Nothing changed. Instead, the State of Utah passed a law designating the Browning M1911 semiautomatic pistol as the official state gun. Arizona is considering legislation to make the Colt single action army revolver the official state firearm; it hasn't passed yet, but it has enthusiastic support from gun nut groups. In Virginia, a law was passed last year to permit the carrying of concealed weapons in bars. (More than 40 states have similar legislation.) Virginia also considered legislation to close the “gun show loophole”; it didn't pass, and one of the key opponents was State Senator John S. Edwards, whose district includes Blacksburg. This is a story that has appeared here before, with different names and places. Jose Figueroa has lived in Canada (currently Langley, BC) since 1996. He isn't a drug kingpin, or have some other sort on involvement in organized crime. He, his wife, and their three children are all Canadian citizens. So, the Federal Ministry of Public Safety wants to deport him. The problem that The Harper Government has with Figueroa is that he spent the first part of his life in El Salvador. During the 1980's, there was a civil war going on there. Figueroa supported what eventually became the winning side, the Farabundo Marti National Liberation Front (FMLN). The Harper Government considers the FMLN to be a terrorist group. Well, in civil wars, terrible things happen. However, the current president of El Salvador, Mauricio Funes, was a candidate of the FMLN. Presumably, Funes wouldn't be any more welcome in Canada than Figueroa is. Figueroa has the support of three MP's, Conservative Mark Warawa and NDP'ers Don Davies and Peter Julian. A couple of support websites have been set up, http://wearejose.wordpress.com/ and http://helpjose.blogspot.com/. Jose's current effort is to travel from Vancouver to Ottawa. When he gets there, he will present a petition of support with at least 1,200 signatures (he'll be collecting more on the way) to Prime Minister Harper. This journey will start on Friday, March 18, with a rally of support at the Vancouver Public Library (350 W. Georgia St.) at 1 PM. Jose's journey requires some financial support. Contributions can be mailed to Jose Figueroa c/o Walnut Grove Lutheran Church, 20530 88th Avenue, Langley, BC V1M 2Y6. I lived in the Virginia suburbs of Washington, DC in 1979, and during this period, I looked up several old friends of mine who had jobs as Congressional aides on Capitol Hill. Some of these people worked for Republican Congressmen, and some of them worked for Democrats, but the story I got from all of them was the same; half of the Members of Congress are crooks. This information was a minor factor in my decision to relocate in Vancouver instead of Seattle or Portland. The situation in Washington hasn't improved since then, and the elevation of John Boehner to Speaker of the House is a new low. I have been aware that Boehner was scum since 1995, when he got some press coverage for passing out cheques from Philip Morris on the floor of the House of Representatives. Matt Taibbi published a thorough expose of Boehner in Rolling Stone: The Crying Shame of John Boehner. It's a long story, and well worth reading. I'll give you a quick summary: Boehner plays 100 rounds of golf a year, and attends an average of 1.25 fundraisers a day. This means that he spends hardly any time at all doing the job he gets a government salary for. He's basically a trained seal; his staff puts a script in front of him, and he reads it. However, Taibbi points out in the first two paragraphs that people like Boehner are the norm rather than the exception in Congress, and makes the case that those who believe that “Washington is occupied by an unbreakable bipartisan conspiracy of favor-churning hacks” have got it right. After you get through the Taibbi article, consider these facts: Fox News is owned by an Australian, and the second-in-command there, Alwaleed bin Talal, is a Saudi Prince. The U.S. Chamber of Commerce, which has Boehner in its pocket, gets heavy funding from outside the US. They spent $75 million on attack ads during the 2010 election campaign, and refuse to disclose how much of this $75 million came from foreign sources. The US is heavily dependent on Saudi Arabia for its oil supply, and heavily dependent on China for the financing of the $14 trillion national debt. What this all adds up to is, the US electorate no longer has any real control over the Federal government. Members of Congress and the President need whackloads of money to get elected, and they're going to listen to the people who pay the bills, not the voters. The Boehners of Washington certainly don't have any conscience to listen to. And if somebody in a position of influence gets uppity enough to criticize this situation, it's not very difficult to recruit a fanatic to shoot him or her. The people of the US will wake up one morning and discover that they have lost their country. It wasn't lost due to a military invasion; it was sold.